Liverpool were the second game in a week for the toffees. Buoyant after an important win on Monday night, Sunday brought our neighbours from across the park. The same side that played at West Brom would get the nod on a pleasant Autumnal afternoon. 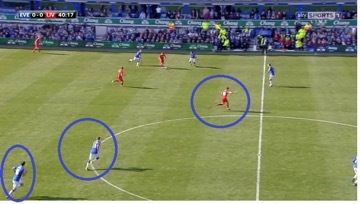 Liverpool played three centre halves with wingbacks and a tight advanced three of Milner, Ings and Sturridge. Everton set up as they normally do, the only surprise being to see Barkley more advanced than Naismith who struggled to get to grips with the position at times. 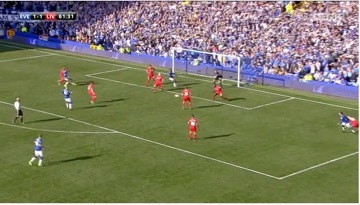 Jagielka prods the ball away and denies Sturridge what could well have been the opening goal. I’ve said this in previous weeks, but it is worth repeating: Jagielka’s performances have gone unnoticed for much of this season (though of late he has started to receive more praise). 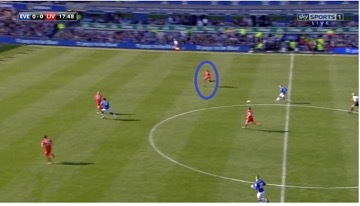 With a patched up back four, Jagielka has been the one constant, and his performances have been superb. Whilst younger players beside him have (rightly) received praise for their play despite their inexperience, Jagielka has barely put a foot wrong all season and his influence on those around him with his assured, dependable play, cannot be overstated. 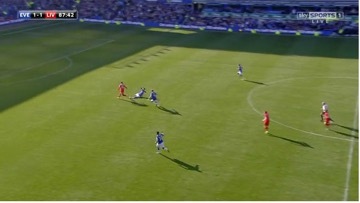 Having intercepted a Sturridge pass in his own half intended for Moreno, Deulofeu carried the ball forward and tried to force a pass into Lukaku. 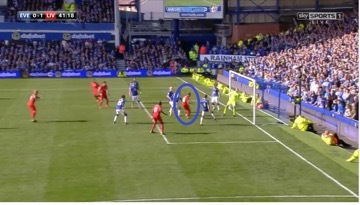 It was a difficult pass and Can was able to snuff the opportunity out as he came inside to cover Lukaku with Skrtel, but with Moreno badly out of position down the other end of the pitch, Deulofeu had the chance to attack Sakho (circled) with bags of space in which to work. 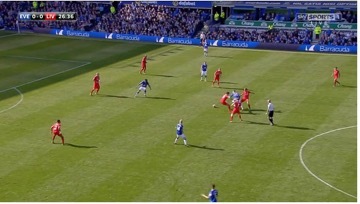 This will have been the plan in Finch Farm all week to create moments like these as Moreno pushed on, and had Deulofeu have started the game well, I think he’d have attacked Sakho here. 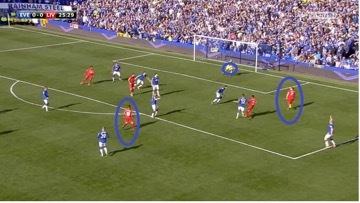 Coutinho was being denied space in the middle of the park by the excellent Gareth Barry and James McCarthy, but Nathaniel Clyne and Alberto Moreno were creeping forward, confident Everton’s play out wide was not threatening to hurt them. Naismith was having a difficult afternoon in an unfamiliar position, and Deulofeu was underwhelming on the Everton right. From the corner, Liverpool would again win the header as they had before from previous corners, but were yet to test Tim Howard from a set piece. 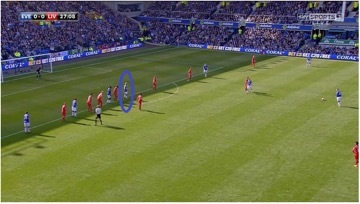 Having conceded from a corner against West Brom, Everton were again looking nervy from corners. 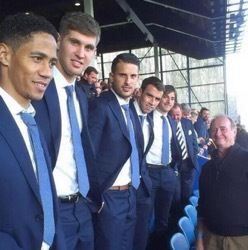 Credit to Barkley for spotting the opportunity, and his delivery was perfect. 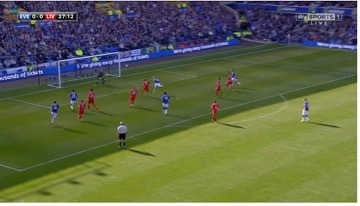 Naismith made good contact, but his header was far too close to Simon Mignolet in goal who managed to tip the header over. Three centre halves on the pitch, five defenders in total, and Liverpool unable to stop the simplest of chances unfolding. The chance appeared to kick a spluttering Everton into life as two minutes later, Mignolet would be forced into his second good save. 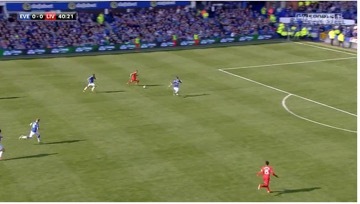 More bustling work from Lukaku as he threw off challenges (more of this please, Rom) inside the Liverpool half and started a move from left to right that ended at the feet of Deulofeu. 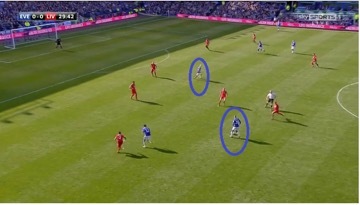 The move was the most fluid Everton had looked to this point, and it coincided with Naismith being momentarily higher and Barkley deeper- coincidence? 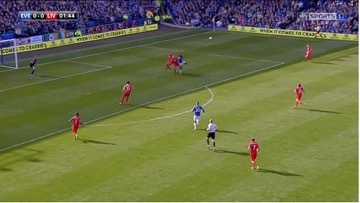 As the ball was struck, Galloway was Everton’s most advanced player having helped start the move down the Everton left moments earlier. 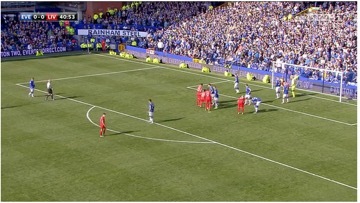 Everton weren’t intimidated facing a team with wing backs for the first time this season, and Liverpool were under pressure, their ‘keeper having now twice dug them out of trouble. Much to the frustration of Daniel Sturridge who has just returned from his latest hip/leg/foot/full body injury to remember his strike partner is no longer Luis Suarez. Superb athletic scrambling defence from Mori. No doubt in a bar in Rio somewhere, Tim Vickery will have watched the chance unfold and eyes as wide as saucers turn to a stranger and in broken Portuguese tried to justify his assessment of Mori by telling him “but he signed Boselli, you know?”. Very early days in his Everton career but so far Mori is appearing to be everything Tim Vickery did not describe. 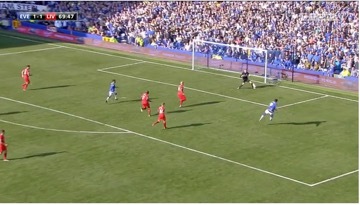 Unfortunately for Mori and Everton, this was all in vain as Liverpool would take the lead from the resulting corner. Poor from both, particularly in the context of what happened in the last match. This should have been addressed all week in Finch Farm, but instead we’ve managed to gift a goal to our opposition again. An awful goal to concede. 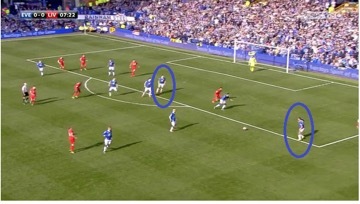 Everton would go on to draw level before the half was out. Deulofeu was afforded half a yard of space to deliver a whipped cross that was only half cleared and found its way to Lukaku. A composed finish from the Belgian leveled the scores. A moment of relief for Deulofeu who from Monday to Sunday would define a hot and cold winger. It was a delivery of real quality from Deulofeu, flat and pacey into a good area just as he had repeatedly done against West Brom. This from the Swansea game the week before and so on and so forth. It was straight at Mignolet who palmed away his international teammates shot with ease. 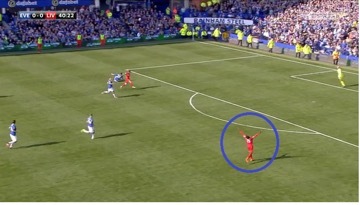 Had it not been for the excellent Mori, aware to the danger, making a last gasp diving challenge, Sturridge was through one on one to win the game as a result of that quick free kick taken seven or eight yards from where it was awarded….. But don’t forget, according to Tim Vickery, Mori isn’t any good. Signing him was a massive mistake from Martinez having signed then Argentinian international Mauro Boselli back in 2010. If Tim Vickery was a scout, he’d be on the dole. The game came to an anti-climatic end, not before Sakho had managed to scoff a handful of courage pills and confront Lukaku in the 89th minute having been bullied by the Belgian all afternoon alongside fellow apparrant hardman Skrtel. Whatever it takes to keep you a cult hero, I suppose, Mamadou.